Sharon Cierniak has been training dogs for over 30 years. She has shown her dogs in many areas of the dog competition world, earning titles in obedience, agility, rally, tracking and carting. In addition to teaching classes, she works full time at PAWS Chicago with the behaviorally challenged dogs, preparing them for successful adoptions in their forever homes. Sharon believes in looking at each dog as an individual to understand their particular training needs. Her belief in positive training methods helped her successfully work with many dogs and people to create a bond of trust and a joy of learning. She is committed to attending seminars and classes in order to continue to add new tools to her toolbox, keeping her classes fun and interesting. 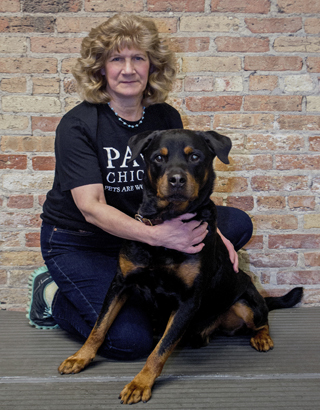 Working in the rescue and shelter world, Sharon has witnessed the positive effects obedience training, agility and enrichment have on a dog’s life at PAWS Chicago. Her passion for dogs and dog training is apparent in all the work she does here. What Sharon teaches at PAWS Chicago: Polite Puppy Class, Level I Obedience, Agility and Private Sessions. Sharon's Dogs: Sharon presently has a 10 year old Rottweiler named Jet who enjoys dog sports and his all time favorite…..SWIMMING! Fun Fact: Sharon started her training career as the neighborhood “free dog walker” back in grammar school.